Sorta WW: Wind & Mud Equal…? 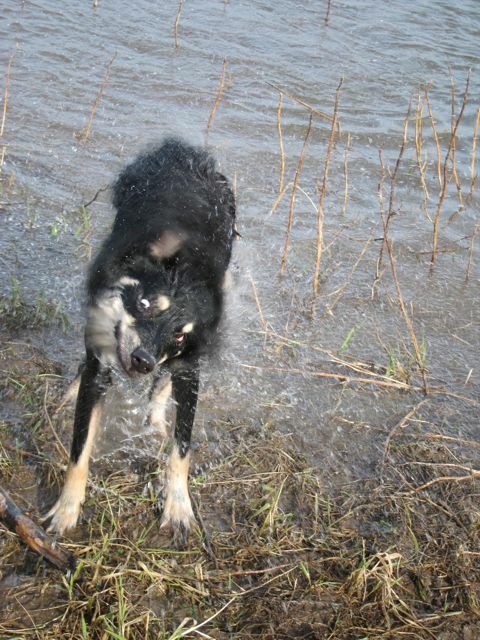 Pretending I’m the creature from the black mud lagoon…. ^ Did you notice the faucet? I now get a warm hose off! Even in freezing weather. WW: Look Mom! There’s still MUD!! 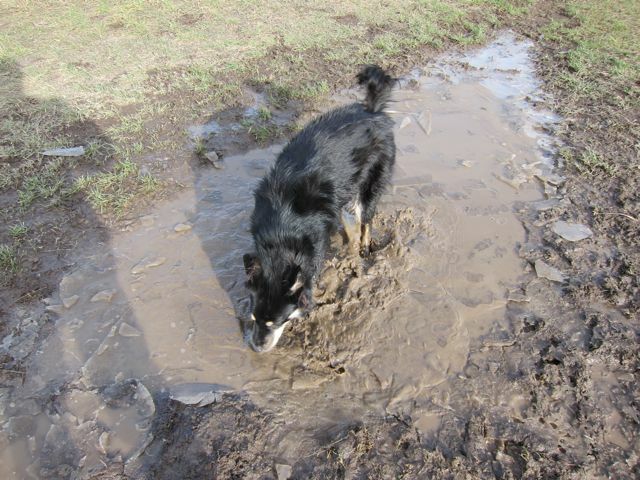 Today, Pamela, over at Something Wagging dedicated her post to the benefits of mud. Yes, I said M..U..D! There are some major benefits… I knew it, I knew it!! 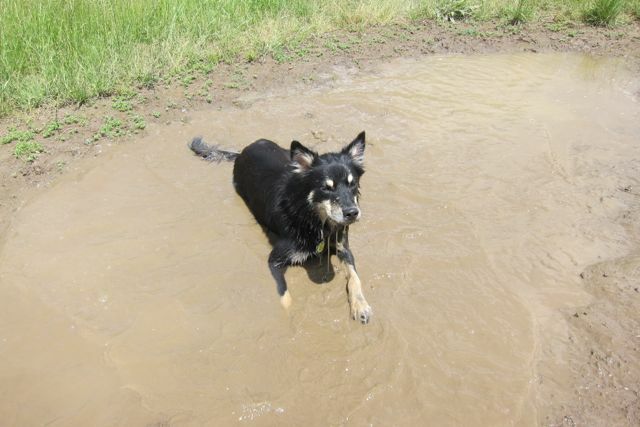 So, I thought back to when I told you what I thought about mud (that was waaaaaay back in January 2011, when Toby was still with us) and decided to re-play that post for you. 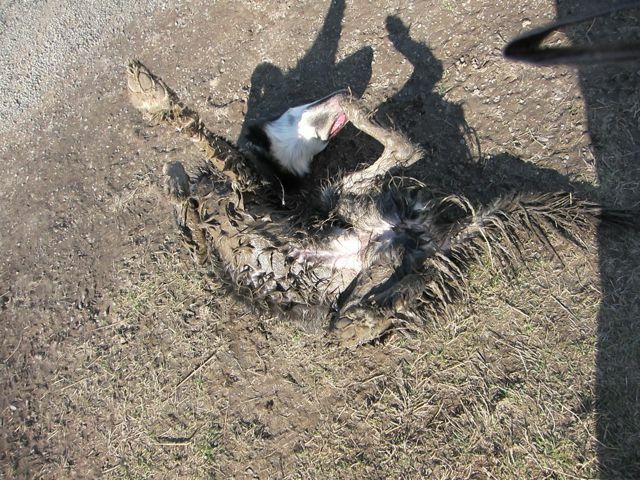 They say a mud bath is good for you. It has healing properties and said to be a beauty treatment that revitalizes the skin; gets rid of toxins; exfoliates and nourishes–whatever. 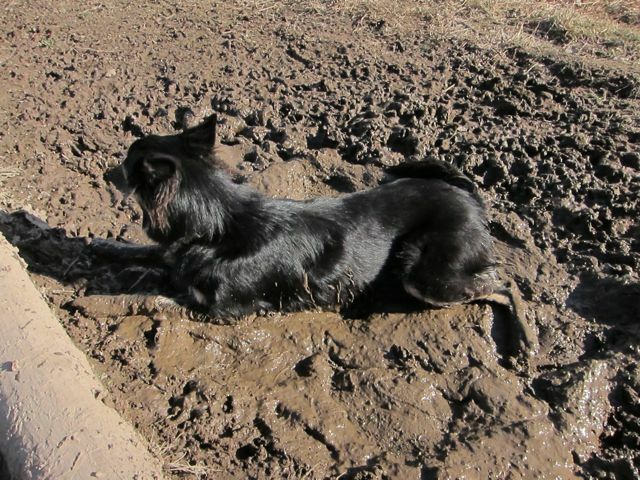 I think mud is just plain good–good to eat and good to lay in. 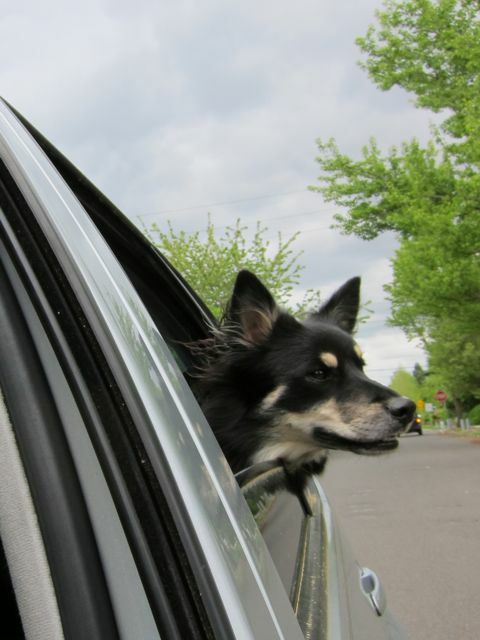 It’s suppose to be warm, or maybe hot–that’s what hu-mans think. 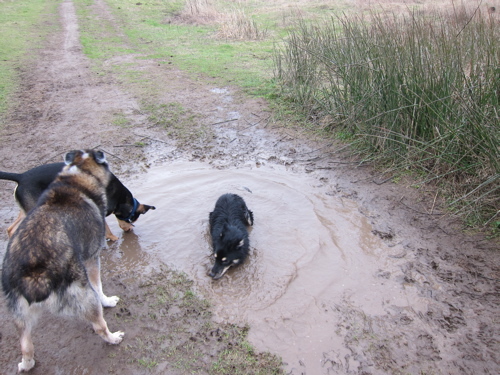 They don’t know the beneficial factors of COLD mud. 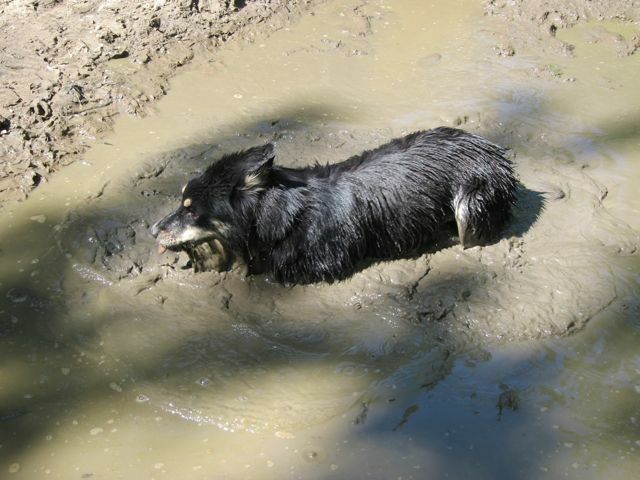 Yes, C-O-L-D COLD mud. It’s invigorating. Who knows how cold that mud was. I don’t have a thermo-meter with me. Mom said it was COLD! 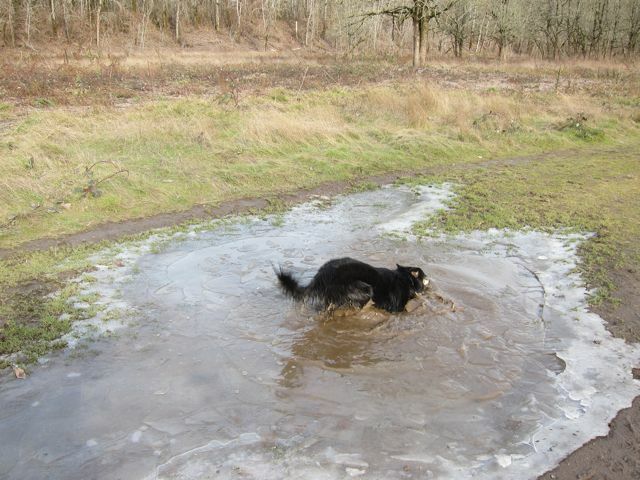 35 degrees COLD, well, not the mud puddle–it was probably colder. Hu-mans are such wimps (except those Polar Bear crazies). They just don’t know good MUD!! Shake it, baby, shake it!! I bet you can’t guess how much dirt was in the tub when I got a bath? Mom wouldn’t even do it in her tub–she took me to this place where they washed dogs. And I scored with a ton of treats!! I was dreaming about a hike to my special place…1000 Acres, of course…and who should show up this morning but Mom’s son and daughter-in-law. They said: “let’s go to 1000 Acres“. This is a special day for Moms, and my Mom is pretty special, so I think taking her to 1000 Acres was perfect! 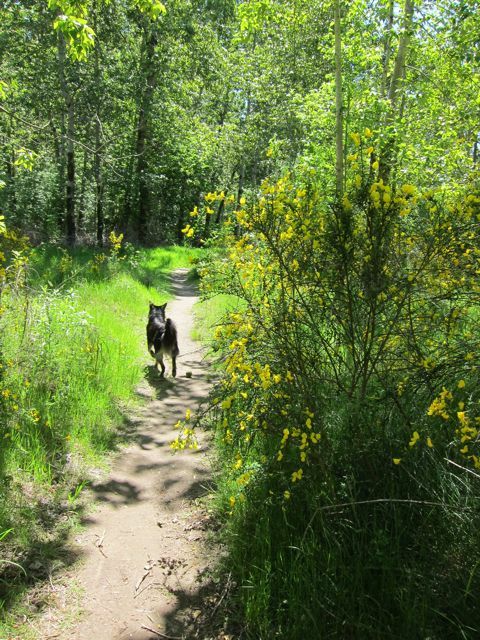 The day was perfect…warm and sunny. Not too hot. A day for Mom. Except….. 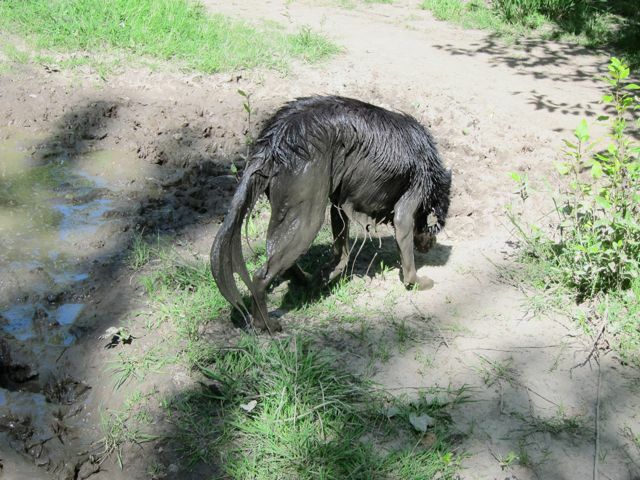 I found a mud puddle And got a bit muddy. I CAN’T HELP IT, MOM. There’s just something about mud that draws me. But the river isn’t far. I’ll get cleaned off. Honest. I’m clean. AND, I don’t stink. 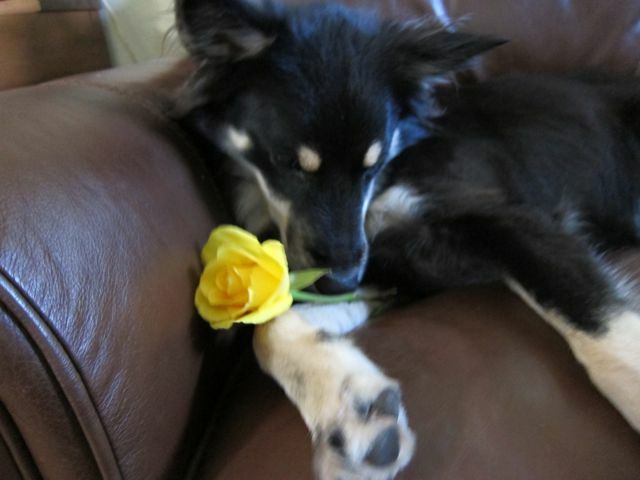 And I got you a pretty flower. 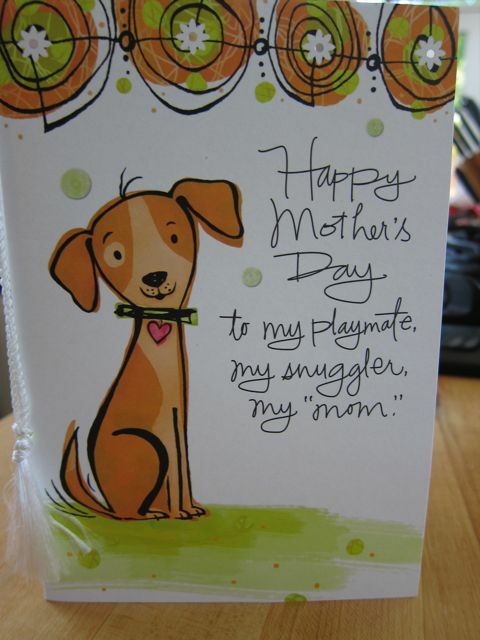 And this is just for you Happy Mother’s Day to my Mom and all the Moms out there. Thanks for being my first Mom and bringing me into this world. Because of you, I now have a wonderful life. As weekends go, this one wasn’t too bad! Did I ever tell you Mom won’t give me a stuffie? I guess it’s because I destroyed all the ones they gave me when I was a puppy. And then I ate the end of one of Maggie’s favorite toys (we called it T-Bone, but it didn’t taste like one) and had I to go to the emergency vet. 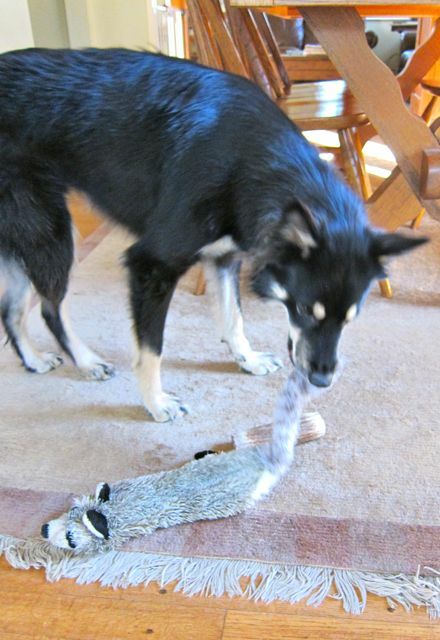 So, I was really surprised when Mom brought home Racoon! 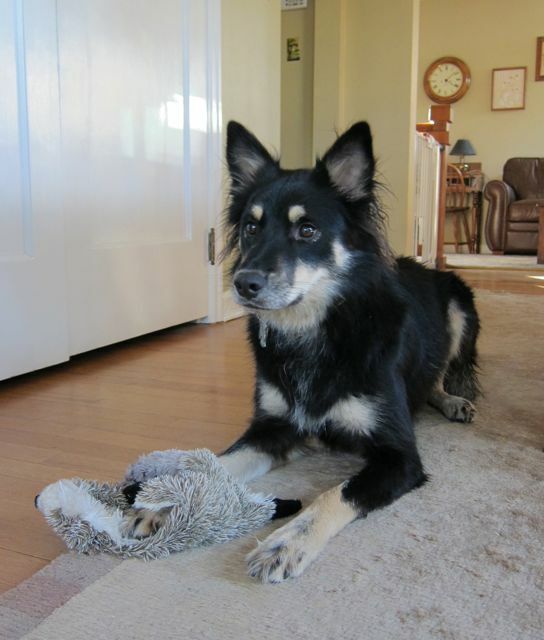 It’s a stuffless stuffie, whatever that means. I don’t care WHAT they call it, it’s almost as good as a ball. Now, you need to notice I said “almost”. But, it’s been 24 hours and my new non-stuffie is still intact! Pretty good, huh? 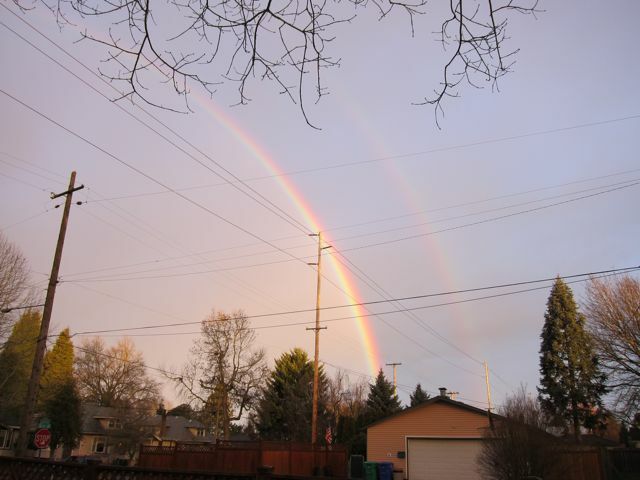 We’ve had some pretty nice weather here in the Pacific Northwest, and Sunday was no exception. 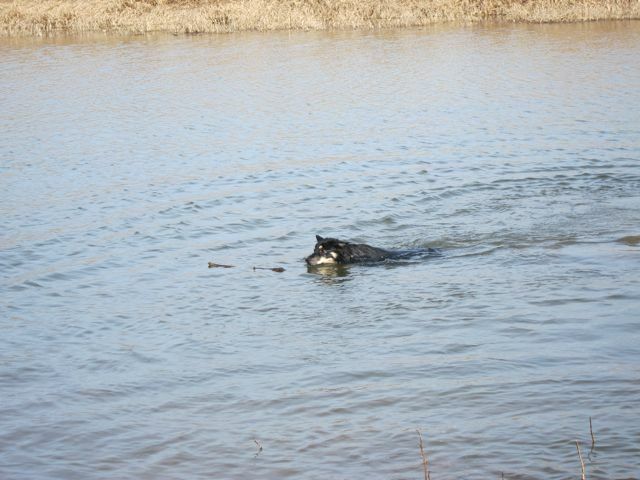 I thought that called for a trip to my favorite mud-hole place in the whole world–1000 Acres. (Oh, right. What else is new?) 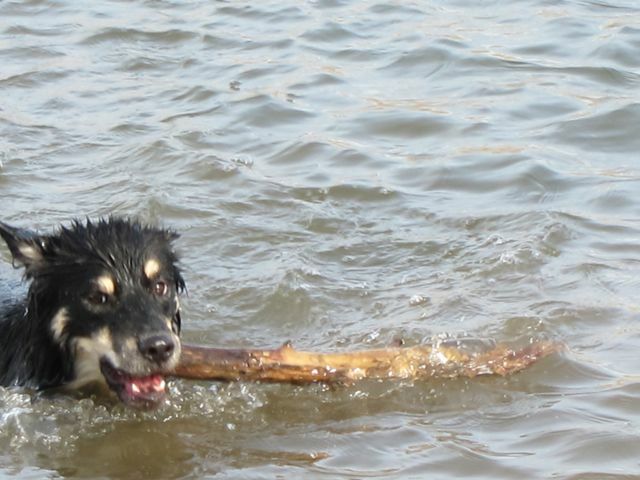 But this time my very first BFFs in the whole world went too (that would be Toby II and Macy)! I was SOOOOOO excited. 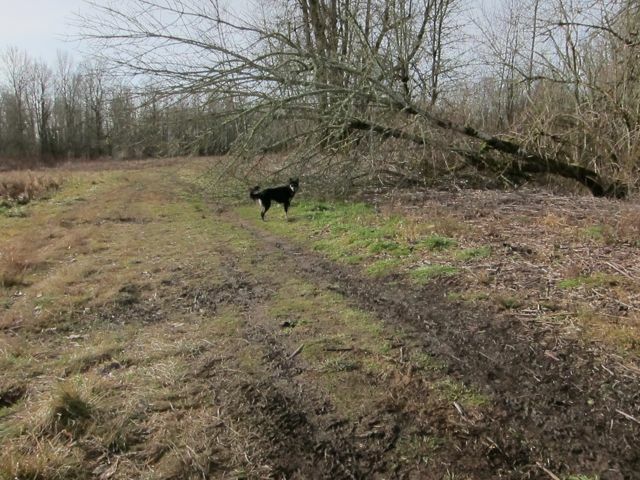 We raced and raced and, then, there it was…my favorite mud hole. I hope you notice there’s not much water. Geez, what’s a dog to do? 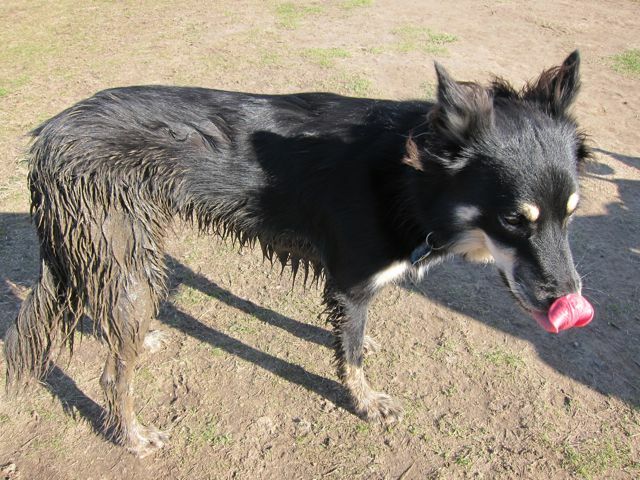 I rolled in the grass and dirt just to see if I could add a bit more…what’s with this drying up mud business? Do I need to learn how to do a rain dance? I think I have a spot of mud on my nose. Can’t have that–a girl has to keep up her appearances. At least that’s what I think! 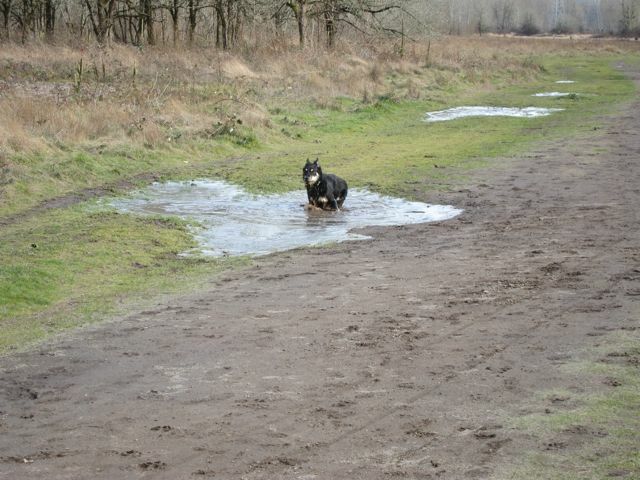 A trip to the nearby pond got most of the mud off, so on we went! My buddy Toby II is out there waiting for me. I heard him say: “Get a move on, Sage! Let’s run.” Darn, that ball was just too interesting. 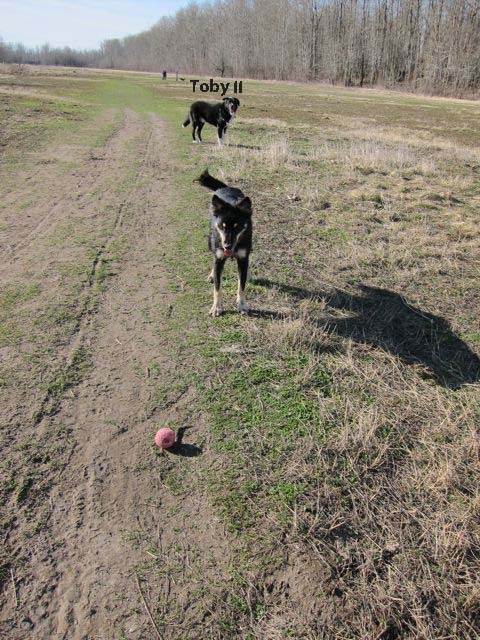 Sorry, Toby II–catch you on the bounce! Hope you had a good weekend. I sure did! Yes, it happened. 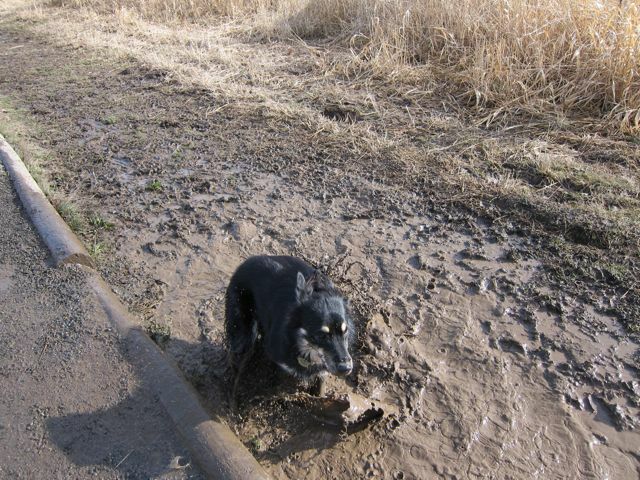 I found mud. 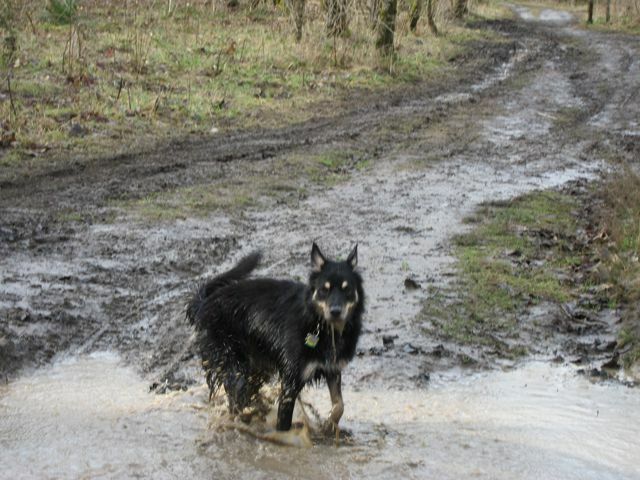 Glorious mud. I bet you were worried. Me? Not so much. 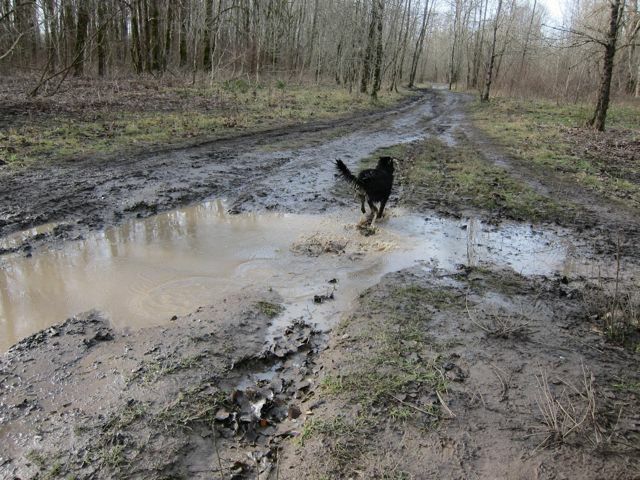 There were several mud puddles out at 1000 Acres. I did have to do a little work, though. It was full of this ice stuff. I made short work of that! 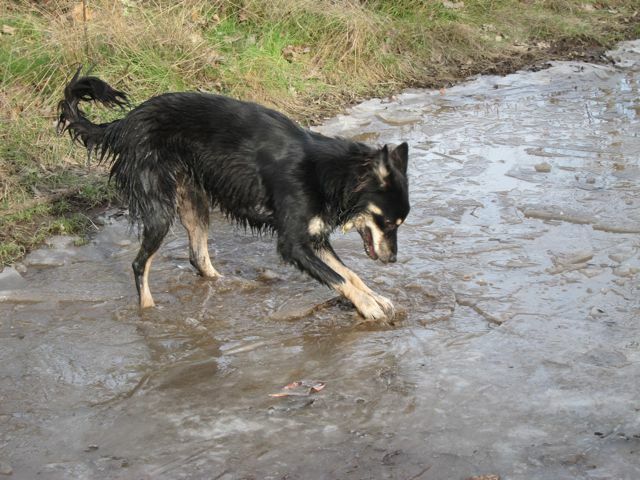 I’ve taken lessons on forging through the ice–sorta like an ice-breaker. 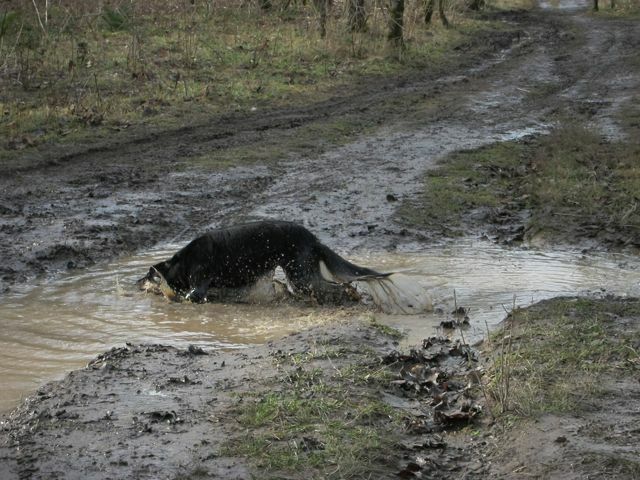 There is no way I won’t, at least, try for some mud. Like the snow, it was pretty puny…..